Welcome to the Psycholers website. Psycholers is a non-profit bicycle/hot rod "club" that was formed in 2006 by Christopher, Benjamin, Heike, and Max Golter. 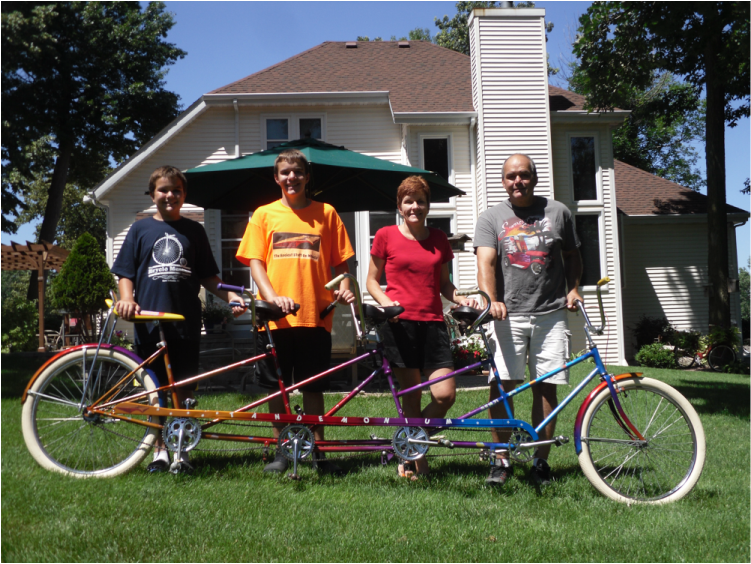 We are crazy about old, vintage, custom, and retro bicycles and have restored and made all kinds of cool bikes. Since we're crazy about bikes, we thought that Psycholers would be an appropriate name for our club. Each bike we come across has a story behind it. Most of our bikes were basket cases when we came across them. We are especially proud of our Orange 1957 Chevy Belair street rod and matching trailer hauling our pair of Schwinn Stingray Orange Krates. We hope you enjoy viewing our Photo Gallery. To see both community and Psycholer stories, go to our Psycholers Stuff tab. To contact us for any reason, click Contact Us. Also, check out our eBay Store for all the cool Psycholers stuff that you can buy. For our fans with smartphones, you may want to consider downloading the free Psycholers App. And for all of our international friends, check out the other languages of Psycholers.com. We hope you like and enjoy the website. Please visit this website frequently as it will be constantly evolving with updates. Check out the video above provided by starrfilms.com. Scan our QR code for Psycholers.com on your mobile device.